A volunteer-run football club for players of all abilities since 1975. An FA Charter Standard Development Club. In the summer of 1975, a group of young boys were playing football in the street near Jack Hammersley’s house. Naturally, the ball spent more time in the gardens than it did in the road. 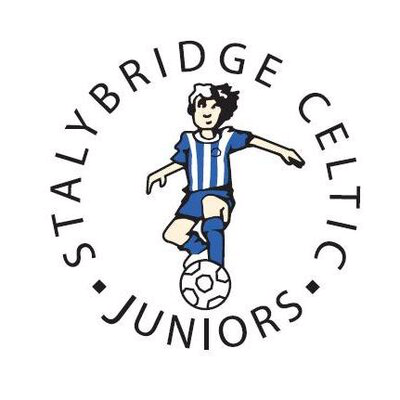 Eventually, Jack asked the boys if they would like to form a team and play in competitive matches, so Stalyhill Juniors, later to become Stalybridge Celtic Juniors, was formed. At the end of 1976/77 season, Bryan Cross volunteered to help run a second team as so many lads wanted to play and, is a club policy to this day, none were turned away. The club gradually went from three teams in the late 1970’s and early 1980’s to teams at all age groups and since the late eighties the club has continued to grow, and today has 30 teams as well as the Saturday Soccer School. In 2000 the club raised funds to buy the old lacrosse club on Mossley Road. Despite two fires, the Soccer School continues to flourish and today hosts up to 120 children of all abilities every Saturday morning and is the starting point for all our junior teams. Teams continue to do well in age & ability appropriate leagues and competitions and travel the UK and Europe competing in tournaments including those hosted by Barcelona and Benfica. In 2014 the Soccer School clubhouse underwent a £120,000 renovation after fundraising by the club and support from FA and Premier League Facilities Fund. Lord Tom Pendry, former MP for Stalybridge and Hyde and president of the Football Association, performed the official opening with club chairman Garry Pearce. Other fundraising events in recent years have seen two appearances from Paul Scholes after retiring from Man Utd in ‘Coaches v Dads’ matches and an annual Walking Football Festival. Today the club has 30 teams, from under 7s to under 16s, this includes girls and pan-disability teams. Teams compete in local leagues including the Tameside Junior Football League and Sunday leagues, The East Manchester Junior Football League and the Cheshire Girls Football League. The whole club is run by an army of almost 100 volunteers who give their time for free, doing everything from coaching, admin and communications to running the snack bar, welfare and ground maintenance. The club continues to go from strength to strength and is now the largest it has ever been, with more local children of all abilities able to play football for Stalybridge Celtic Juniors than ever before.